← BRAIN DEAD? WHO SAID? GOD SAID “NO”! I SAY “WHOA”! Bishop DiMarzio begins by praising President Abraham Lincoln’s for signing that noble Executive Order known as the Emancipation Proclamation that freed slaves who were being held in the Confederate states. “How far we have come as a Nation that 160 years later we will celebrate the inauguration of Barack Obama as the 44th President of the United States!” he says. But his praise for the president ends there. He points out that we have just commemorated the 40th anniversary of Roe v. Wade, which legalized abortion and started the “pro-choice” movement that was rooted in the ideology of Planned Parenthood founder Margaret Sanger who advocated for the elimination of the “unfit” such as the poor and blacks. “Of course, a young Barack Obama was precisely the sort of unfit child that Sanger and her allies would want to eliminate,” the bishop writes. The forces of death press on from every side in contemporary American culture, the bishop writes, and cites the passage of ObamaCare which obligates Catholic institutions to provide employees with medical procedures and services that violate Church teaching. “The President and his supporters sought to make this election, at least in part, about women’s rights. Much has been written about how the targeting of key constituencies was intended to stimulate specific votes,” he writes. Regardless of whether some find his tone to be “a bit strident”, Bishop DiMarzio believes the time has come for more direct conversation on these matters if we are to preserve what is left of our God-given and constitutionally-protected rights. “Abraham Lincoln was a man who understood the intersection between politics and nobility,” the bishop writes. Although Lincoln would never have been able to pass the Thirteenth Amendment, which abolishes slavery, in 1863, he used the powers of his office to free “slaves” by issuing his Emancipation Proclamation. “I would have hoped that the first African-American president of the United States would have stood on the side of freedom for all. 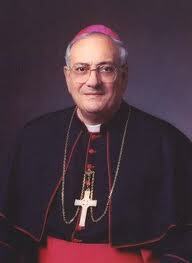 Instead, he stands on the side of political expediency,” Bishop DiMarzio laments. This entry was posted in Abortion, INTOLERANCE, LIBERALISM, LIFE ISSUES, MEDIA BIAS, MEDIA BIGOTRY, MORAL RELATIVISM, POLITICAL CORRECTNESS, POLITICAL LIFE IN AMERICA, PRESIDENCY OF THE UNITED STATES, RACIAL DISCRIMINATION, RELATIVISM, SAVING CHILDREN, THE GREAT SOCIETY, THE RIGHT TO LIFE, WELFARE STATE, WITNESS TO THE TRUTH and tagged Abraham Lincoln, barack obama, Bishop Nicholas DiMarzio, Brooklyn Bishop Nicholas DiMarzio, President Obama. Bookmark the permalink. 2 Responses to BRAVO BISHOP NICHOLAS DiMARZIO!!!!!!!!!! Msgr, Courage will help bring about God’s plan for our rescue. And I love the bishop who sent this and the bishop about whom he wrote. If only they were all so committed to good shepherding. We are praying that the trees stay upright. Doug took St. Joseph holy water all around yesterday to bless the trees. May move to the downstairs rec room where we have a fireplace, hide-a-bed sofas, and a lot of the space is under ground level. Plus the door to the outside parking pad is right there. Not sure any of the bedrooms on the top floor are safe. Hope you have food to last a few days. You may hear lots of sirens in the next few days. Hope Mary Kay is safe. Prayers for protection during this storm, Betty PS About 10 people throughout the country are working together now on the problems with palliative care and organ donation. and how they tie together. From my vantage point, this may be the turn we were praying for. LOVE BISHOP NICHOLAS DiMARZIO! I have heard him speak out on Catholic issues before, he is a very Holy Man.If only others would follow The Lead of Bishop Gracida, Dimarzio Burke etc The Church would be stronger. God Bless Him!! !